St. Albans - On the evening of September 6th, 2017, our father took our mother’s hand to join him in heaven. Born in St. Albans on April 22nd, 1929, Janet was the daughter of the late Harvey and Adele (Lancaster) Brault. She was 88 years old. Janet married Carlton K. Bartlett on November 24th, 1949, he predeceased her on May 24th, 1998. 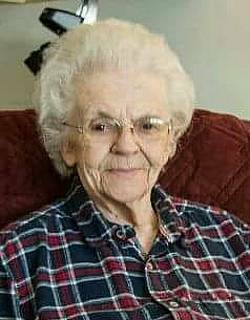 She was a longtime bookkeeper at the Grand Union Store in St. Albans, a communicant of St. Mary’s Parish, where she was involved with the Bereavement Committee. Janet was a former member of the Business and Professional Women of Franklin County and Green Mountain Post # 1, American Legion Auxiliary. Janet is survived by her loving family, Carolyn Bartlett-Flood of St. Albans, Susan Howrigan and her husband, Thomas, of Fairfield, Mary Bartlett and George Samson of St. Albans; grandchildren Matthew and Kerri Howrigan of Fairfield, Luke & Nicole Howrigan of Fairfield, Tyler and Jen Howrigan Fairfield, Connecticut, Alex and Lise Howrigan of Highgate, Molly Lovelette and James Williams of Westford, Adam and Liza Lovelette of Milton, Shaun and Andrea Lovelette of St. Albans, John Flood and Sofia Diaz of Indianapolis, Indiana and Chris and Kathy Quinn of Dover, New Hampshire. She is also survived by her great-grandchildren, Liam, Gabe, Cole, Reid, Nolan, Finn, Eva, Nora, Corinne and Chase Howrigan and Sarah and Caitlin Quinn; her nieces, Christine Lynch and her family and Nancy Brault and her family and her beloved feline companion, Chloe. In addition to her parents and husband, Carlton, Janet was pre-deceased by her great-grandson, Grady Howrigan on July 28th, 2017, her brother, Edward Brault, nephew, John Brault and sister-in-law and best friend, Claire Brault Jette. In the heartbreaking loss of our mom, our entire family would like to express our love, our gratitude, our appreciation to Homestead....for their devotion, their compassion, their dedication and their love: Especially Sara Holmes, Lacey, Justin, and Jem. At Janet’s request, there will be no calling hours. A Mass of Christian Burial will be celebrated on Tuesday, September 12th, 2017 at 11:00 A.M. at St. Mary’s Catholic Church, 45 Fairfield Street, St. Albans. Interment will be in the family lot in Mount Calvary Cemetery. It was Janet’s request that memorial contributions go to Luke and Nicole Howrigan, for the Grady’s Golden Goodness Fund, 689 Lapland Road, East Fairfield, Vermont 05448 or Franklin County Animal Rescue, 30 Sunset Meadow, St. Albans, Vermont 05478. To send the Bartlett family a written expression of sympathy or share a memory, please go to Janet’s on-line guest book at www.healdfuneralhome.com.